Available from Kalamazoo Direct is a Forklift Truck Inspection Pad. A checklist to work down in the presence of the forklift. If passed then attach a green sticker. If failed then attach the red sticker. Helps you keep tabs on the condition of the forklift, as well as carry out any health and safety obligations to the forklift drivers. 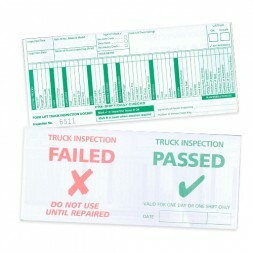 A Forklift Truck Inspection Pad helps your managers carry out important safety checks on a forklift. This allows you to keep track of any maintenance required and contributes to the health and safety of the operators.